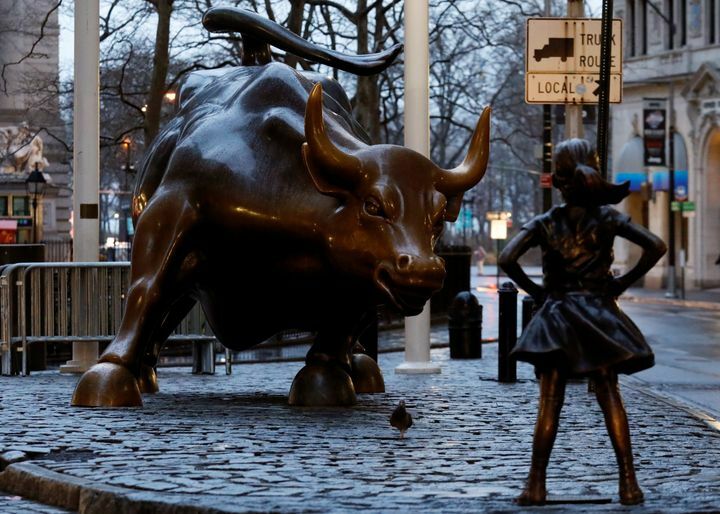 An asset management group installed a sculpture of a young girl facing the famous charging bull in New York Citys financial district Tuesday morning. State Street Global Advisors, the worlds third-largest asset manager, put up the bronze sculpture as part of an effort to call on the 3,500 companies it invests in to increase the number of women directors ahead of International Womens Day. The company, which managed just under $2.5 trillion in assets at the end of last year, said it would vote against corporate boards that do not take steps to increase gender diversity. We believe good corporate governance is a function of strong, effective and independent board leadership, Ron OHanley, the companys president and CEO, said in a statement. A key contributor to effective independent board leadership is diversity of thought, which requires directors with different skills, backgrounds and expertise. Today, we are calling on companies to take concrete steps to increase gender diversity on their boards and have issued clear guidance to help them begin to take action. Women hold fewer than 20 percent of corporate board seats in S&P 500 companies, according to Catalyst. State Street cited data showing that one-fourth of Russell 3000 companies have no women on their boards.Companies with strong female leadership perform better than those that do not, according to a 2015 studycited by State Street. Kristen Visbal, who sculpted The Fearless Girl, told The Wall Street Journal she considered having the girl charging against the bull, but ultimately decided the girl should squarely face the animal. The sculpture is a composite of the daughter of a friend, and a 9-year-old Latina girl, Visbal said. Wall Street is a traditionally male environment and it says, Hey, were here, Visbal told the Journal. To me, it says a woman can be delicate and petite, but strong. The nighttime instillation of the sculpture evoked the installation of the bull itself. In 1989, artist Arturo Di Modica installed the bull in lower Manhattan in the middle of the night as a symbol of New Yorks toughness after the 1987 stock market crash. ThisWomens History Month, remember that we have the power to make history every day. And in 2017, that feels more urgent than ever. Follow along with HuffPost onFacebook,Twitterandgram”}}’>Instagramin March using #WeMakeHerstory.